Good communication is the key to success in every walk of life. Whether it is about your business ventures and personal relationships, your communication skills will certainly help you in a big way. You might have seen a person with good communication style, not only holds prowess at his work but also earn respect from his customers, colleagues and competitors. 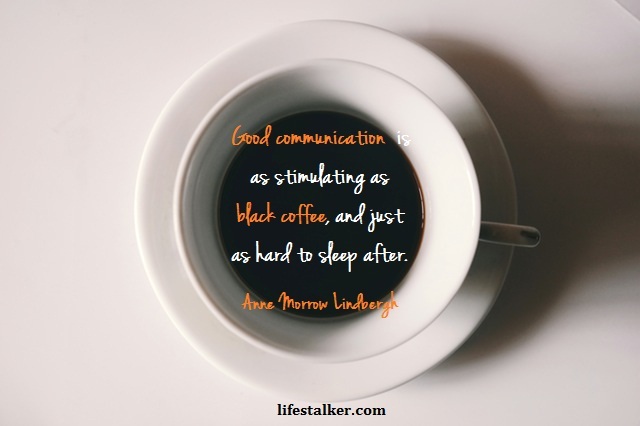 So, you don’t have to communicate. You have to communicate in good and effective manner. However, before learning, how to communicate in an effective manner? One should learn, what is the communication? And why it is so important? Moreover, one should know that without exploring these two question, the first question is of no relevancy. If you try to flip the pages and find the meaning of word ‘communication’ in a good English dictionary, you will find that the word ‘communication’ comes from Latin word ‘communicare’ and roughly defined as an act of sharing information by the means of speech, writing and other systems. The above dictionary definition looks like a dead definition of such a powerful word. In actuality, the word ‘communication’ means much than above dead dictionary definition. It means the act of sharing your emotions, idea, and knowledge with a person and acknowledging emotions, idea and knowledge of that person. Acknowledging, because communication is not a one way process, it is a two-way process. You can’t really communicate without acknowledging others. If you do, it only proves that you are not a human, you are a robot. As I have mentioned above, a person with good communication skills not only shines at professional front but also at personal relationships. It is because with clear and effective communicative style, one can deliver his message without any confusion and set his or her expectations. It also help others to provide their feedbacks without any reservation. On personal front, it allows you to understand your partner better and how you both want things to shape and grow. It helps you to defy the odds and sustain your relationship in hard times. Effective communication allows you to clearly define your goals and set a time framework. So, if situation demands, you can tackle the problems within set time framework. But for this, you have to be clear with your team and customers. Otherwise, it will earn you bad reputation. Defining goals is also important in your relationship as it will allow you both to reassess what you both want in your life and how you want them. Effective communication supercharges your learning process. Many of us feel shy to ask questions. Mostly because of the simplicity of the question but we never understand answers to complex things lies in simple things. For say, how will you convert light years in kilometers when you don’t know a light year is unit of length, not time. It is only when you learn a light year is a unit of length, you will be able convert it in kilometeres. In similar manner, it is not bad to ask your partner about your mother-in-law birthday or brother-in-law’s work, as they sound trivial and i-should-know type of questions. But, in reality, these questions help you to learn better about your partner and grow your relationship. How to Communicate Clearly and Effectively? To speak well and effectively, first and foremost thing that you need is your belief in your abilities. And if you believe in yourself, half the task is done. As I have mentioned, it begins with you. All you need to believe in yourself and make your move. You do not have to be aggressive or lame, just keep it simple. Speak clear and loud enough, so everyone can hear you and never ask you to repeat because he/she was not able to hear you loud enough. Most of us believe speaking slow make you sound boring and unintelligent and it is not appreciative. However, it is not the real case. Speaking slow is generally appreciated. Because people are able to understand your words. On other hand, speaking too fast makes it hard for listener to interpret the meaning of your words and makes you sound aggressive and dumb. So, speak somewhere in the middle range, not too slow, not too fast. A highly recommended and acceptable speed is to speak at 6 words per second. To overcome slow or fast speech barrier, practice in front of mirror. By practicing the way you speak in front of mirror makes it easier for you to reassess your way of speaking. You will better understand your speech and facial expression, which ultimately boost your confidence. Make eye contact with people, it assures them that you are not just blabbering; you are really talking to them. As I have mentioned it earlier, communication is not simply an act of sharing information but in reality the act of sharing emotions, ideas and everything, and acknowledging them. Additionally, it is not a one-way process, it is a two-way process. So, when you make eye contact with the person or audience you are talking, they connect with your idea, your emotions and more importantly, you. Eye contact helps you to understand the emotions of the person or audience. As you can easily judge from their facial expression and body language, whether they are interested in your talk or not, whether they are getting your points straight or not, whether they want to know something but they are not able to ask (because they think everyone will laugh). Meanwhile, it also indicates you whether you are going on right track or not and buys you a time to reassess yourself in the course. Suppose that a person is confused because he did not know a million means ten lakh not one crore and not able to keep up with you as you often switch from a million to a crore to define the sales of your product in international or Indian market. Suppose that you are telling the story of Ramayana to someone and person is confused in between Sita and Janaki, not realizing that you are not talking two persons, but one. In such case, ask your audience, whether they are getting your points or not. If not, help them. Don’t fuss, by just looking at them and leave them unattended. It often happens that we forget what we were talking about or what we have to talk about. It is pretty embarrassing moment for all of us, when you actually don’t know about the topic, you are speaking and it is much more embarrassing when you are saying exact opposite of what you have to actually say. It happened with me once, when I gave first presentation of my life in front of a offshore client. It was so embarrassing moment for me and I was not able to cope with tension afterward. Though, my manager was angry for messing it up but on very next day, his anger was all gone and helped me to cover up in front of senior management. He was quite nice. Thank you Sir. It was my story but you are not that lucky enough. Again, you should know how to speak in front of your partner or friend or anybody else. You should know about your limits. So, even if you don’t want to hurt them and it was intended in a humorous way. It will dampen your relationship. So, think before you speak. Most of us think of a pause in a negative manner and consider it as a sign of weakness. But it is not like that. You have to pause like Twain. Mark Twain once said, the right word may be effective, but no word was ever as effective as a rightly timed pause. Do not afraid of making pauses. I believe it is better to pause, reassess yourself and then re-enter into the conversation. It is certainly better than to talk unwittingly without knowing what you are talking and regret it afterward. Pauses also add a humane shade in your speech and make you not sound like a gibberish-sound-making machine. Using an example from your past experience and including them in a pitch to your client is certainly helpful. It will be helpful in terms of making your client understand what your products are all about. Moreover, it will be easier for your client to know, how your partnership and product is good for them in different ways. All you have to remember, don’t use bombard them with examples. One or two will do the work. You want to impress your peeps or customer with your in-depth knowledge of your work or sophistication of your language. You use too many lingos, jargons, slangs, technical words, and words of Victorian age English. Don’t do that. Don’t be a jerk. Just keep it simple silly. Though, a word or two will not harm but then don’t throw a dozen of them. Your body language is also one of the major factors when it comes to the communication. Moreover, I believe it is the most important factor. If you are not comfortable about yourself. So say, how others can be. Don’t be harsh on yourself. Take it easy. Take a deep breath. And go for it. Don’t be too critical of yourself. If you have made a mistake and it is not that relevant, don’t apologize, and just move with your pitch. Because it will draw unnecessary attention and you will end up in ruining your entire pitch. It doesn’t mean you have to move ahead with your speech, every time. There are situations where you have to cut in the middle and correct yourself and there are situation where you don’t have to. It depends upon your consciousness, when to stop and when not. Generally, I don’t stop if I am talking about a story, because for me, the message of the story that matters not story itself. But I do correct myself when I have to talk about important figures, names and places. Converse with more and more people. It doesn’t mean, you have to be douche and starts talking to every person you meet in Metro. Be open. Converse with people who are around you. Converse with who you admire. Learn how they talk in meetings and private circles. So on, and so that. What is more important than starting a conversation, is the art of listening. The Greek stoic Epictetus has said, we have two ears and one mouth so that we can listen twice as much as we speak. These little conversations and observations will help you to know, how to deal it when you have to speak in a meeting or address to large public or present your case in front of your boss or client in person. See how things are changing for better. Realize it is not only you. Realize how they are pretty much like you. They also want to talk but they are as confused as you. But now you know the secret and they want to know it from you.